Tomorrow is international Gratitude Day, a day created by the United Nations Meditation Group to encourage people to express thanks and gratitude towards one another. - As you go through your day, mark all the things that support you and keep you going and try to foster a grateful attitude towards them. For example: "I am grateful for the bus and metro system (even if it isn't as efficient as you might like!) which allows me to get almost anywhere in the city without the expense and ecological harm of a car," or "I am grateful for my tea cup which allows me to drink my tea." It's amazing how many little things contribute to our existence and acknowledging them really makes you feel blessed and in tune with the universe that sustains and is part of you! - Tell someone why you appreciate them. Maybe even write them a letter and give them some flowers! - Instead of saying you are sorry (or as well as), try saying how much you appreciate the person instead. I do this every day! Instead of feeling like a mess-up, you feel blessed for the understanding and supportive people around you. The Secret is an international phenomenon that has inspired millions of people to live extraordinary lives. 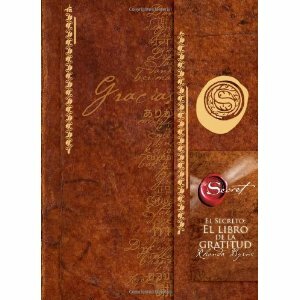 Now The Secret Gratitude Book provides an incredibly powerful tool to live The Secret, and to bring joy and harmony to every aspect of your life. Filled with insights and wisdom from Rhonda Byrne, this beautiful journal offers a framework for practicing the power of gratitude each day, enabling you to attract every magnificent thing you want into your life. With a foreword by Louise L. Hay, The Power of Infinite Love & Gratitude will help readers discover the mysteries of the subconscious mind and learn how to transform their lives. Key lessons help unleash the mind and body's infinite capacity for healing and provide a deeper understanding of stress, enabling one to move more easily through life. 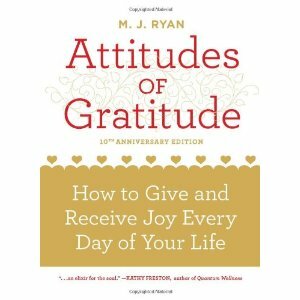 In Attitudes of Gratitude, M.J. Ryan teaches readers how to unlock the fullness of their hearts and lives through the expression of gratitude. "Gratitude helps us to return to our natural state of joyfulness," she writes, "where we notice what's right instead of what's wrong. It makes us feel complete, that we have everything we need, at least in this moment." 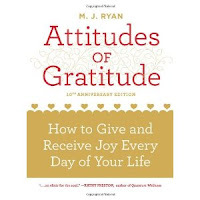 In her introduction to this 10th anniversary edition, Ryan recounts current research that bolsters her original thinking - people who practice gratitude on a daily basis are, by and large, happier, healthier, and more effective in the world. She also shares with readers brand new, top 10 gratitude practices, which readers of the first edition and people she?s taught and counseled over the years have provided to her. 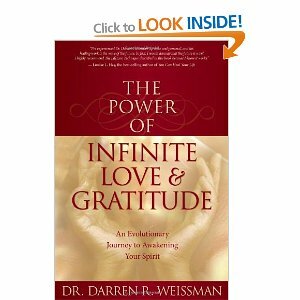 The concept of this book is very simple and very profound: - Gratitude creates happiness - It?s a fact of life (and science as it turns out). Plants create carbon dioxide and gratitude creates happiness. Also, come join us from 6pm-7pm to show out appreciation for a wonderful member of our community without whom the Montreal Pagan community would certainly be poorer! Thanks to all our customers and friends who help keep the store going and make the Pagan community in Montreal better and brighter! We are grateful for your support! You're the best! Gratitude; all the cool kids are doing it! You can have gratitude and still have attitude! 20th Anniversary and Mid-Autumn Moon Ritual!